Each year during January and February we organize a 100 Acts of Kindness Challenge! Our goal is to accomplish 100 acts of kindness before Valentine's Day! Each week we issue a Kindness Challenge! For Week 3 Megan challenged everyone to make some Kindness Rocks and leave them for people to find. For week 2, we challenged everyone to play our Kindness Game. During Week 1 we encouraged everyone to do an act of kindness for Senior Citizens. For our challenge this week we want to encourage everyone to make and send a BOX OF LOVE to someone who needs to be cheered up or shown some love! One of our good friends recently had surgery to remove some cancer. We love her and wanted to show her some support in a simple way that would allow the kids to get involved too! We grabbed an Amazon box and turned it into a box of love! 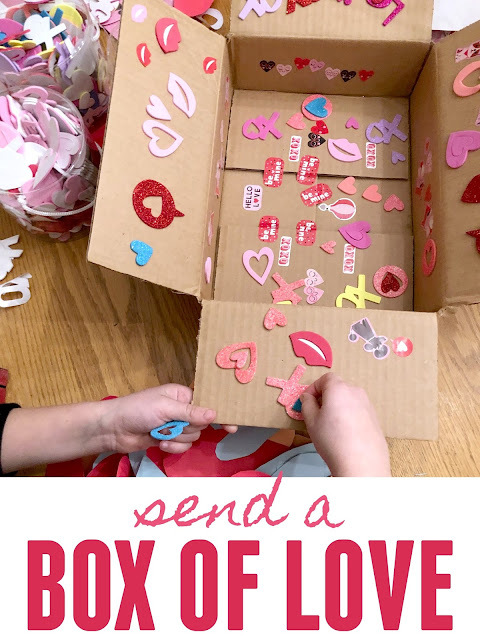 To make our box of love, we drew pictures, wrote notes, and cut up a bunch of hearts! The kids decorated the inside of the box with stickers everywhere! We filled the box with cut up hearts and wrote different encouraging statements on each heart! We also added in a bunch of Hershey's chocolate hearts and some other treats inside the box. Lastly, we put a roll of painter's tape in the box so that our friend could stick all of her hearts up in her hospital room. I wish I'd remembered to get a photo of the finished product! After we were done, we wrapped up the box and sealed it closed with packing tape and sent it off to our friend! We hope that it brought her comfort and some support during this hard time! We challenge YOU to find someone who could use a BOX OF LOVE this week and mail it to them (or just secretly drop it off at their house). Make sure to report back in our 100 Acts of Kindness Facebook group if you try this out! If you need additional Kindness ideas, head on our to our Kindness Pinterest Board.